Also acknowledged are the efforts of volunteers to revive the memory of the Jewish heritage in Lviv. LVIV, Ukraine — The Ukrainian city of Lviv, once a major center of Jewish life in Eastern Europe, commemorated on Sunday the 75th anniversary of the annihilation of the city’s Jewish population by Nazi Germany and honored those working today to preserve what they can of that vanished world. 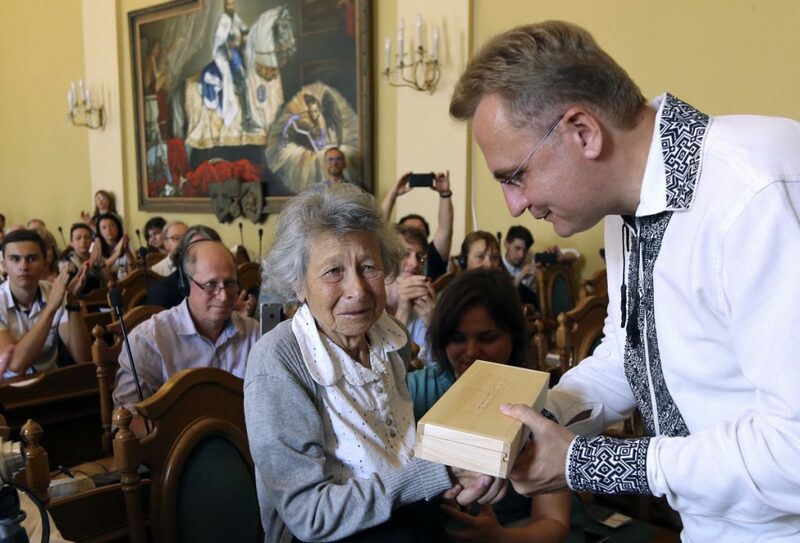 City authorities presented the honored recipients with 75 glass keys – replicas of a metal key that once belonged to a Jewish synagogue and which an American artist found at a street market in Lviv. The anniversary events, which included a prayer concert at the ruins of former synagogues, come amid other attempts to revive suppressed memories of the Jews who once were an integral part of the region. Iryna Matsevko, deputy director of the Center for Urban History of East Central Europe and an organizer of the anniversary events in Lviv, said it was the first time the western Ukrainian city has acknowledged the historical preservation efforts in such an extensive way. Matsevko said consciousness is growing in Ukrainian society of the need to remember the Jews who were annihilated by Nazi forces, in some cases with the participation of local people. Initiatives have included introducing Jewish history courses at universities, new research by young Ukrainian scholars and grassroots efforts by volunteers, such as the recovering Jewish gravestones that were used to pave roads and returning them to cemeteries. Before World War II, Lviv and the surrounding area belonged to Poland. Then called Lwow, it was the third largest Jewish community in prewar Poland after Warsaw and Lodz, with most working as merchants, manufacturers or artisans. Before World War I, Lviv and the surrounding area were part of the eastern Galicia region of the Austro-Hungarian empire and the city was called by its German name, Lemberg. An old synagogue key discovered by artist Rachel Stevens at a market in Lviv, Ukraine, rests beside a glass replica that she made. In June 1941, Germany attacked the Soviet Union, its former ally. When the German forces entered the city, they and their Ukrainian collaborators massacred Jews in the city and countryside. While occupying the area, Germans murdered Jews in the ghetto, the Belzec death camp and a forced labor camp, Janowska, with the final annihilation completed by June 1943. Of a population of about 150,000 Jews, only an estimated 1 percent survived. The remembrance work is taking place as Ukraine finds itself mired in crisis and conflict following Russia’s annexation of Ukraine’s Crimean Peninsula and a continuing Russia-backed insurgency in the east. Nationalism has been on the rise, and some Ukrainians laud the Nazi-affiliated irregulars who fought against the Soviet Army in World War II. To what extent this has led to greater anti-Semitism is a matter of dispute. Some of the people trying to sustain the history of Jewish life in western Ukraine think the amount of anti-Semitism is exaggerated as part of a Russian propaganda effort. Among those honored was Marla Raucher Osborn, an American who heads Rohatyn Jewish Heritage. The group’s projects include restoring a Jewish cemetery in nearby Rohatyn. 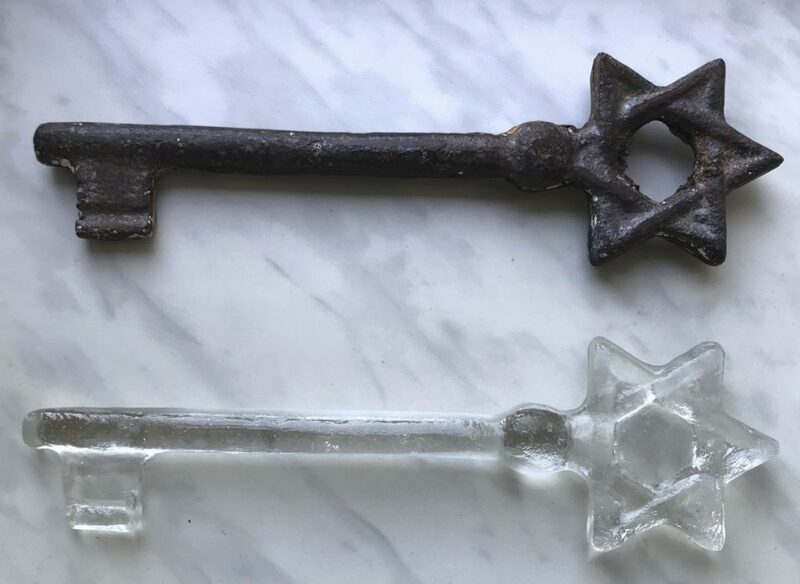 The glass keys were the work of New Mexico-based artist Rachel Stevens, who found the rusted synagogue key on which they were based in February while seeking remnants of Jewish culture in eastern Galicia as part of a research project.